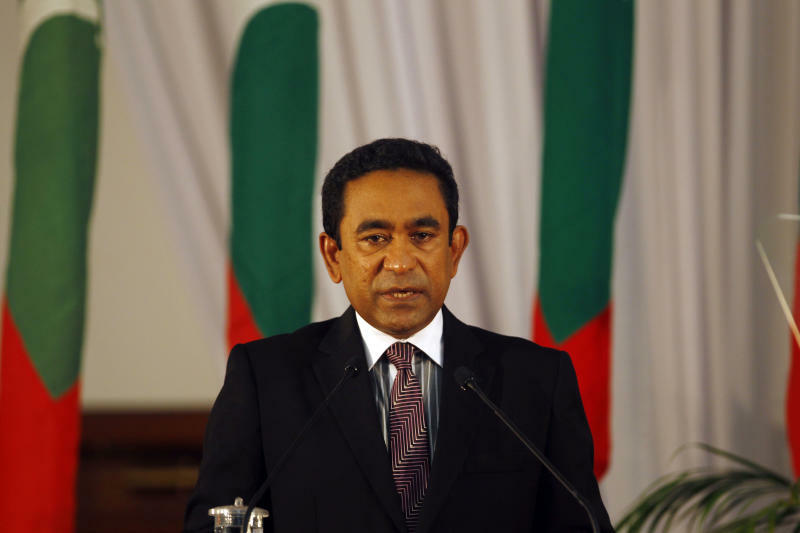 MALE, Maldives (AP) — The brother of the Maldives' former authoritarian ruler was sworn as the country's new president on Sunday, a day after his runoff victory capped a messy election that raised concerns that the tiny archipelago nation's fragile new democracy was in jeopardy. 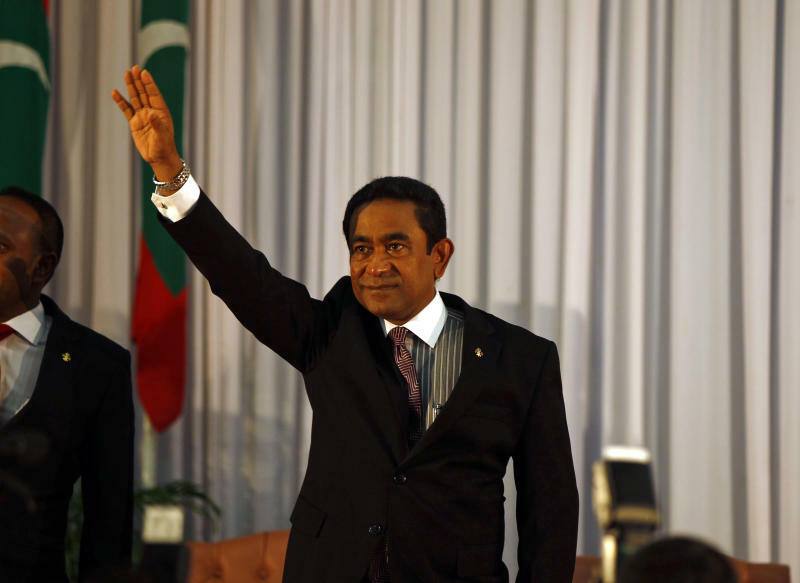 In a close runoff on Saturday, voters chose Yaamin Abdul Gayoom, the brother of former autocrat Maumoon Abdul Gayoom, who ruled the Indian Ocean nation for 30 years, over the Maldives' first democratically elected leader. Gayoom and his deputy, Mohamed Jameel, were sworn in Sunday by the country's chief justice. Gayoom received 51.4 percent of the vote Saturday, according to the Elections Commission. Mohamed Nasheed, who led the Maldives' struggle for democracy and was elected president in the country's first multiparty election in 2008, had 48.6 percent. Nasheed, who resigned last year amid protests, was the leading vote-getter in the Nov. 9 first round, with 47 percent to Gayoom's 30 percent, but a runoff was required because no candidate got 50 percent. Addressing the nation after being sworn in, Gayoom said his main priority would be to "increase the love of the religion and the nation" and bring back stability. He also promised economic policy changes that would give more opportunities to youth, fishermen and farmers. He conceded the election Saturday and said he would not challenge the results. "This is a very happy day for all of us. We now have an elected president," he said. "We don't want to go to the courts." Nasheed received 45 percent in a Sept. 7 election, but the result was annulled by the Supreme Court after Ibrahim complained that the voters' register contained made up names and those of dead people. Last month, police stopped a second attempt at holding the election because all the candidates did not accept a new voters' list as the court had mandated. The court intervened again to change the runoff election date, which had been set for the day after the Nov. 9 vote. 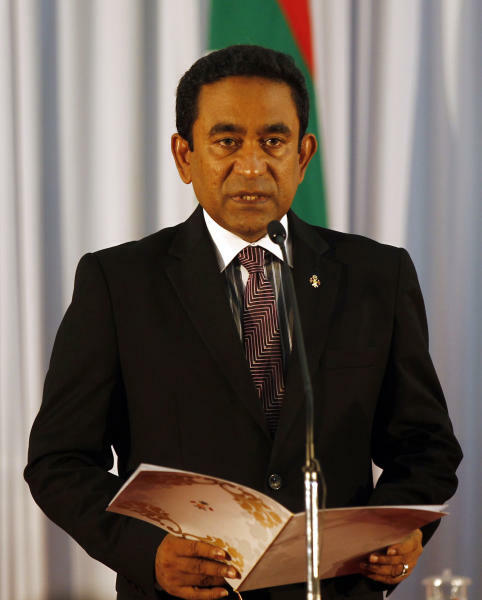 It also ordered incumbent President Mohamed Waheed Hassan to continue in office despite the official end of his term on Nov. 11, purportedly to avoid a constitutional void because the country was past the legal deadline to elect and seat a new president. The U.S. Embassy in Sri Lanka congratulated Gayoom and said it looked forward to working in partnership with him.